I’m pleased announce that after all this time, I have finally migrated the Cocktail Hour blog onto one of my own hosted websites, BergenStudios.com. It will now be treated as a part of the Bergen Studios | Photography entity. The biggest improvement are larger photographs for viewing. 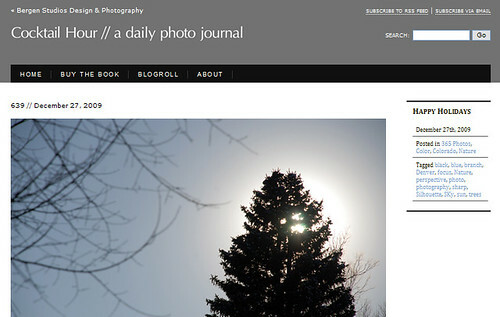 It’s a photoblog! We should see photos on a larger scale and as the main focus. I’ve also expanded my Blogroll to include not only my favorite photographers, but also photography and camera resources, links, books and more. Please update your bookmarks, and take a moment to re-subscribe via email if you want to see Cocktail Hour in your inbox first thing in the morning — because, who doesn’t want a cocktail then ;). 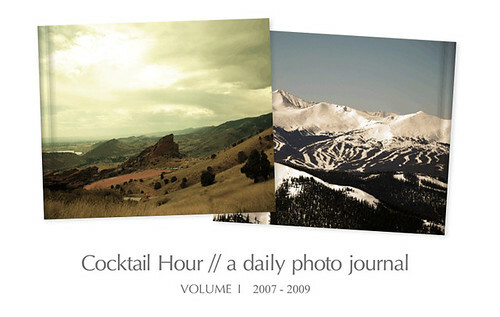 In addition, I am so very excited to announce that I have published a book of Cocktail Hour to Blurb.com. It includes 175 of the 800+ photos that I have blogged about from 2007-2009. I had a lot of fun designing the book, and encourage you to look at the book preview and perhaps order one for yourself or as a gift. I am currently selling them at cost — in the future I would like to sell for a little bit more and donate all proceeds to benefit an organization for kids & photography or perhaps to the Aperture Foundation. First, I’d like to gauge interest level and figure out how I could drive the proceeds. I thank you so much for your support, whether you’ve been reading for years, months or just days. I look forward to sharing more with you in 2010!